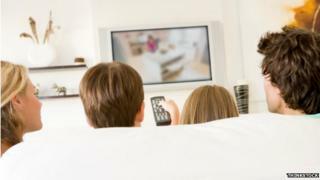 Children who lead inactive lives are likely to grow up to become middle-aged couch potatoes, a study suggests. Researchers compared the TV viewing habits of more than 6,000 British people born in a single week in 1970, at the ages of 10 and 42. Parents should increase children's physical activity to ensure they become fit and healthy adults, the University College London authors conclude. "Do something active to displace TV," advised co-author Lee Smith. "In the evening time when families tend to sit down and watch TV they should try to go for walks instead. "If you can't go outside, try active computer games, anything that gets people up and expending energy rather than sitting down and snacking," said Dr Smith, of the UCL epidemiology and public health department. The authors acknowledge that for today's children TV viewing is often replaced by time on computers, smartphones or tablets. But Dr Smith stressed the issues are the same, that computers and phones are "just a different way of sitting down and relaxing", and parents need to encourage children to be more active. The study draws the British Cohort Study, which gathers information on the economic circumstances, health, physical, educational and social development of people born in England, Scotland and Wales in 1970. When they were 10, their parents were asked how often the children watched TV and played sport. Their height and weight were recorded, as were their parents' occupations. At age 42 they were asked how much time they spent watching TV and on a range of physical activities and sports. They were also asked to assess their health and weight. The study shows that the children who watched a lot of TV aged 10 were 42% more likely to spend more than three hours a day in front of the screen as adults than those who watched relatively little television in childhood. The 42-year-olds who watched TV for at least three hours a day were more likely to be in only "fair" or "poor" health and to rate themselves as either overweight or obese. They were also more likely to have had fathers who were overweight and in routine or manual jobs. The sons and daughters of manual workers were twice as likely as managers' children to watch more than three hours of TV a day at 42, even after their own educational qualifications had been taken into account. Parents who are manual workers "are more likely to be physically active at work and may compensate for this by spending more time sitting down during their leisure hours", suggests another of the researchers, Dr Mark Hamer. "Their children may then model their mothers' and fathers' leisure activity patterns. "It is important that children keep active. And if they can be encouraged to participate in sports, so much the better." The authors believe this is the first study to use a large, representative birth cohort to correlate childhood and adult TV viewing habits and health. "Our work indicates that parents' health-related behaviours may at least partly influence children's TV viewing habits more than three decades later," said Dr Hamer.